Area high school students, parents and members of the community are invited to visit Glen Oaks Community College on Tuesday, Oct. 11th for the 26th annual St. Joseph County College Night. 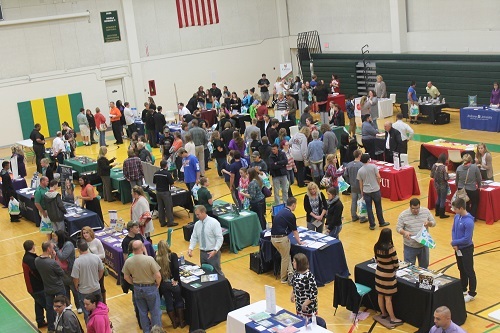 Representatives from over 50 colleges and military organizations will to be on hand to meet prospective students and share information on their institutions. The event will be held in the college gymnasium from 6:00 p.m. to 7:30 p.m. The event is free and open to the public. “This is an opportunity for students and parents to meet and speak directly with college representatives throughout the evening, without having to visit various campuses, make telephone calls, or search the web for information,” said Adrienne Skinner, Glen Oaks Director of Admissions. College representatives will answer questions about the admission process, entrance requirements and programming. Students will have the benefit of exploring higher education options available to them, all in one convenient location. Centro Vida will offer a free presentation in Spanish to Hispanic students and parents from 5:30 p.m. to 6:30 p.m. in the Dresser Business Development Auditorium. A free Financial Aid Information Session will take place from 5:30 p.m. to 6:30 p.m. in the Nora Hagen Theatre, Room D235 at Glen Oaks. Jean Zimmerman, Glen Oaks director of financial aid, will discuss how students and families can take advantage of federal and state grants, scholarships and loans. Zimmerman will also address the application timelines and deadlines critical to the overall financial aid process. For more information, contact the Glen Oaks Community College Admissions Office at (269) 467-9945, Ext. 253 or toll free (888) 994-7818.